Still not convinced that Facebook is a mobile company? According to a new study by digital advertising company Quantcast, the social network accounts for 24 percent of mobile referrals to news and entertainment sites, and Facebook is now the largest third-party browser on iOS, responsible for 12 percent of browsing on the mobile operating system. Facebook is showing us where to find content on mobile, and it’s also providing the platform to consume that content; Facebook’s in-app browser is now the leading third-party browser on iOS. For a recent Re/code article, we found that in-app browsing is responsible for 24 percent of iOS page views. 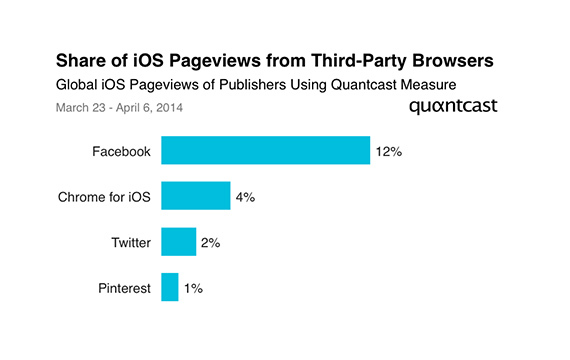 The Facebook app was responsible for one-half of that figure, or 12 percent of all iOS browsing. That’s three times the page views of the next-largest browser, Chrome for iOS. 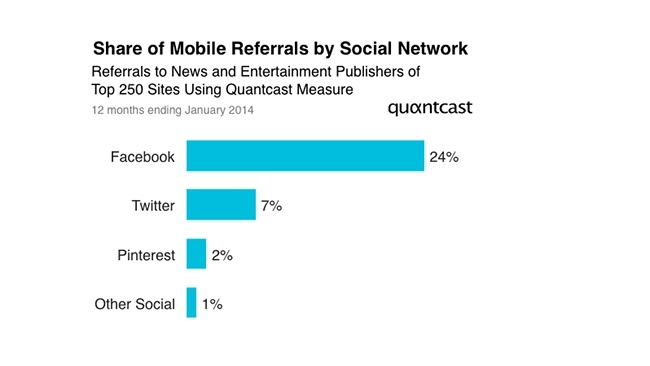 Readers: Were you surprised by any of Quantcast’s findings?